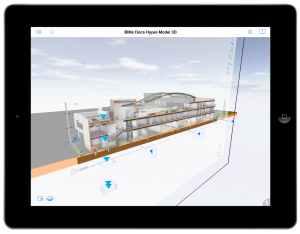 When “BIMx Docs”, the first mobile product from GRAPHISOFT was first introduced at the GRAPHISOFT BIM 2013 North America User Conference in San Diego, CA – there were audible gasps in the room and bursts of applause at how cool it really is. When you see it on the Apple Store and download your copy – you’ll probably have some oohs and ahs to share as well. 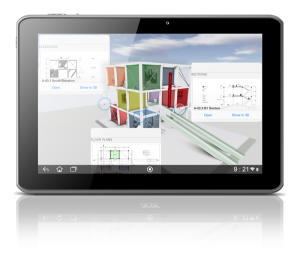 BIMx Docs changes the way BIM (Building Information Modeling) projects are explored, by putting a full BIM on a touchscreen such as an iPad. Architects, their clients and building contractors will benefit from the BIMx Docs app which represents the next generation of mobile presentation software. 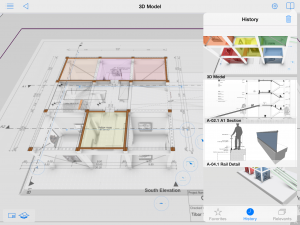 The advanced “Hyper-model” technology found in BIMx Docs fully integrates 2D & 3D making navigation more intuitive, smoother and faster than most other construction-related model or documentation viewer mobile apps. 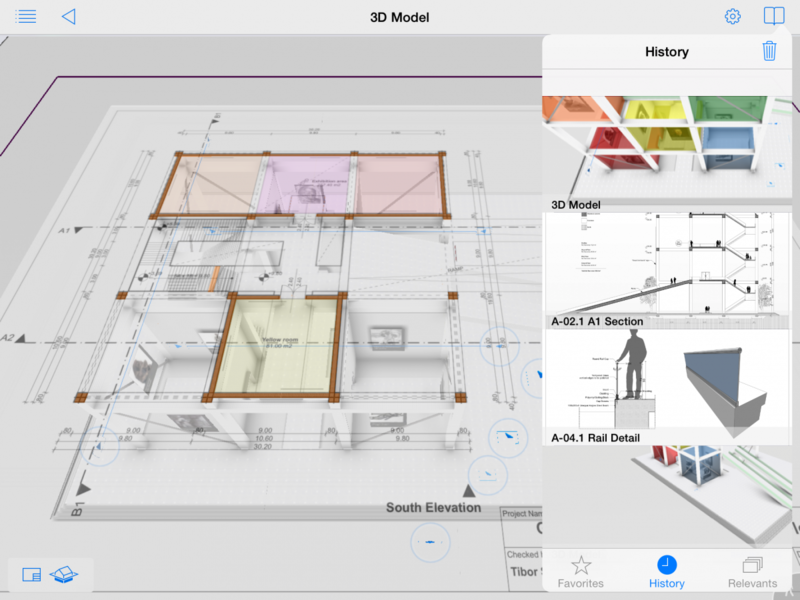 Featuring outstanding performance and smooth navigation even on full-fledged large scale BIM projects with several hundreds of layouts – viewers can fly through the model they’re accessing with BIMx Docs on an iPhone/iPad. BIMx Docs have model-based context sensitive hyperlinks. These hyperlinks function much like any hyperlink on the Web but possess orientation in the 3D space as well as in the 2D drawings adding an invaluable extra dimension to understanding the model while simply navigating in it. BIMx Docs can assist architects in demonstrating their BIM and plans for a project to anyone who may be unfamiliar with understanding 2D plans or even 3D static views. The way BIMx Docs works on an iPad helps overcome that obstacle with easy to comprehend transitions from room to room. 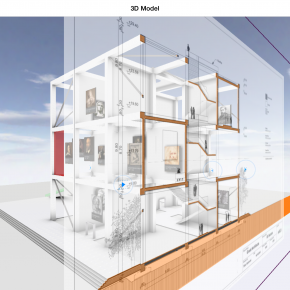 An added benefit is the interactive slider that lets the user explore the BIM in an entirely new way. This ease of use is maintained even when the user is navigating through a very complex model. 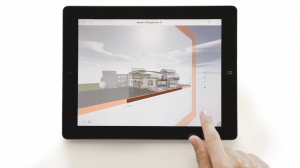 It is a way for the architect to view the entire BIM – no matter where he or she is. Clients can view and explore the project in a way that helps them fully understand the scope of the project. Contractors get their own digital copy of the project that can be updated as needed – it enables site supervision and visualization of the details to on-site workers. BIMx Docs features a direct link to the BIM project in the BIM authoring tool. By tapping into GRAPHISOFT’s cloud-based BIMx Transfer Service anyone can see the latest updates and publish project updates to any project stakeholders. I was at the North American conference this last week and I was so impressed with BIMx and with the conference overall. I am already anticipating going again next year. 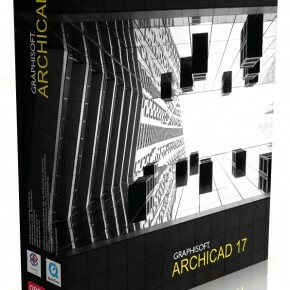 The US Archicad/Graphisoft market it BLOWING up in a good way and looks to be another great year. The software rocks and is so FAST!!! 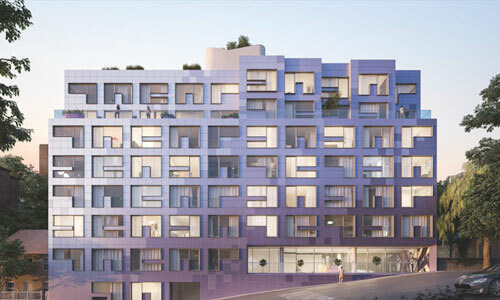 Performance is the edge Archicad has, and it is the performance that will be what creates truly great projects. Congrats Graphisoft!!! Development is working on an android version of BIMx – they would be interested to know who is on android being that the real number of android users who have downloaded BIMx is much less than Ipad/Iphone IOS. If you android users make some noise and download the app it will be important. KEEP in mind that android can run on BAD hardware which will make any performance app seem slow and glitchy. Just make sure you are running android on the best hardware possible if you are going to try BIMx. yes, android version for bimx docs too, please, but thank you for bimx too, it is great! An android version is in the works, stay tuned!